In this title, the Easter story is charmingly retold in very simple language, with 60 picture stickers for children to fill in the gaps in the story, to help build vocabulary and reading skills. It is illustrated by Norman Young, illustrator of the popular Usborne "Bible Tales" series. 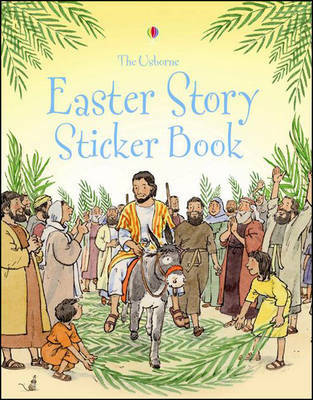 Easter Story Sticker Book by Heather Amery was published by Usborne in February 2008 and is our 291st best seller. The ISBN for Easter Story Sticker Book is 9780746088753. An ideal way for a young child to be introduced to the story of Holy Week and Easter. The simple text accompanied by excellent illustrations has the added interest of missing words that can be replaced by stickers from the central pages covering outline drawings of such things as the donkey, palm trees, door etc. Once the stickers are used, you still have an excellent story book of course. Got a question? No problem! Just click here to ask us about Easter Story Sticker Book.